As the FIDE World Chess Championship in Chennai comes to a close, RIR explorers the wealth of upcoming chess talent in India and Russia. 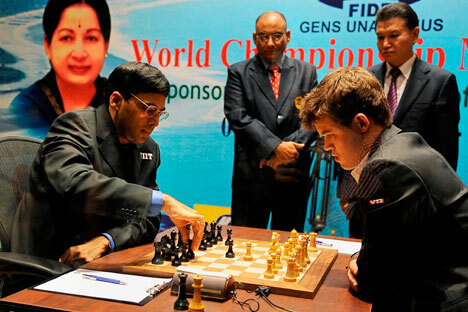 The ongoing chess festival in Chennai and its nationwide following indicates the popularity of chess in India. A number of chess tournaments are running parallel to the summit clash. The Women International Grand Master tournament, a first of its kind event in India, has been taken by Mary Ann Gomes of Kolkata against tough competition from her Georgian counterparts. The Grandmaster International Open is ongoing with participation of over hundred players from 17 countries. Several other age-specific national competitions are underway. While India is steadily growing in chess prowess, the dominance over the battlefield of 64 squares is still held by one nation—the fertile ground of GMs—Russia. The country has an average Elo rating of 2743 for the total 2217 titled players. 24 out of the top 100 players are Russians. Four out of next year’s eight championship candidates are from Russia. They belong to a lineage of legendary players like Mikhail Botvinik, who later mentored the three great K’s of chess – Karpov, Kasparov, and Kramnik. The present day situation is such that between the two countries there are many GMs who have the potential to be future world champions. While Vladimir Kramnik still is at the forefront of the Russian brigade, there are quite a few others who are raring to march ahead. In 2004, Kramnik faced defeat at the hands of the chess prodigy Sergey Karjakin in a blitz game. The same year Karjakin beat the computer program Deep Junior. Born in Ukraine and a Russian citizen since 2009, Karjakin holds the record of being the youngest ever grandmaster. Out of the more recent tournaments he has won Norway Chess in May this year. Out of the ten contestants in this event seven were the top-ten ranked. Karjakin drew his game against Veselin Topalov of Bulgaria to take a sole lead ahead of players like the world number one Magnus Carlsen and the world champion Viswanathan Anand. This has been his biggest victory till date and he has already earned a spot in the next year’s Candidates Tournament. In September, Dmitry Andreikin got the better of Karjakin in the quarterfinals of the world cup. Though Andrekin lost the finals to Kramnik, he too has qualified to contest as a candidate for next year’s championship. Another name that could’ve been in the list of qualifiers is of Alexander Grischuk who is renowned for his blitz play. In 2012 he came close to being a challenger when he beat Karmnik in the semi-finals. Well aware of his strength he drew both the regular and rapid games to take the contest to blitz playoff and won. In the finals however, Boris Gelfand of Israel denied him this strategy. Peter Svidler, who has been a regular at these contests for some time, was preferred over Grischuk as the wild card entry to the Candidates Tournament. Svidler is the current Russian champion—a title he has earned seven times since the nineties. India’s hope to build on Anand’s feats is on the likes of the twenty year old Parimarjan Negi who is currently ranked fifth among the FIDE juniors. In 2006 Negi toppled Carlsen’s record and became the second youngest grandmaster, behind Karjakin. Negi has scored a couple of significant wins this year including the Politiken Cup that he won ahead of better seeded players. Negi was preceded by Pentala Harikrishna as the youngest Indian GM, who is also playing in good form. In January he debuted in group A of the Tata Steel Chess tournament and finished in seventh place and also crossed the landmark figure of 2700 Elo rating points. He was the winner in group B in the previous edition of this event. In August he added Biel Masters International to his list of wins for the year. Another young name that recently shot to prominence is that of Baskaran Adhiban. He caused two major upsets in the first and second round of the World Cup this year and finally conceded to Hikaru Nakamura of USA in the third round. Pumped up by his performance he went on to win the Barcelona Open later. In the women’s league the strongest contender for the women’s world championship is Koneru Humpy. Currently ranked third, she has been in the top five since 2007. She is the second female player ever, behind the world number one Judit Polgar, to cross the 2600 mark. Her latest win was at the Tashkent Grand Prix in September against an all-star line-up. All of these talented GMs are still several years younger than the typical age that chess players reach their peak (Carlsen being an exception) and are bound to be part of the chess elite.